Can Prayer Make a Difference? Absolutely! Do you want to make a “powerful and effective” investment in the State of Georgia? 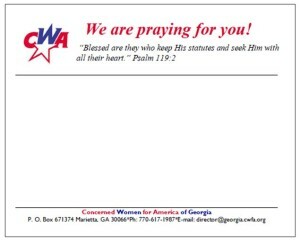 Consider participating in the annual Encourage-A-Legislator Prayer Project sponsored by Concerned Women for America (CWA) of Georgia. We are very excited to be embarking on our thirteenth year of prayer and encouragement, and we want to invite you to be a part! 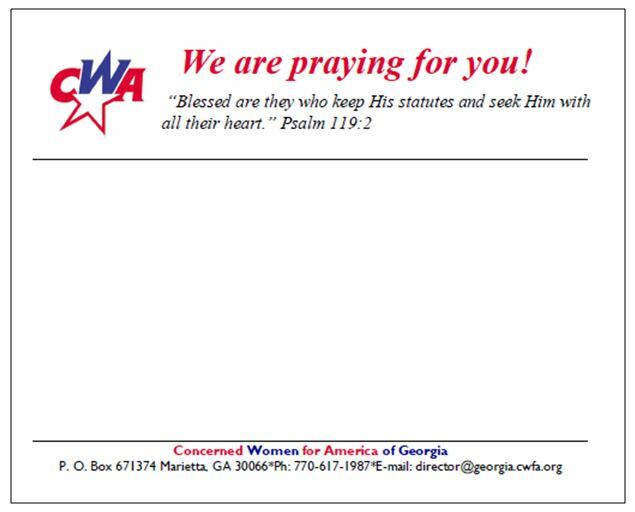 If you are new to CWA, the EAL project consists of sending postcards of encouragement and a commitment to pray for a state legislator during the 2016 Georgia legislative session. The Encourage-A-Legislator Campaign is not used for lobbying purposes. The Encourage-A-Legislator Prayer Project impacts state legislators. It does this in two ways. First and foremost, it intensifies and ensures consistent prayer for each legislator. Second, it encourages and builds bridges with the conservative legislators as well as those who do not normally agree with CWA. As prayers are offered on behalf of the legislators and they receive your postcards, hearts are changed and encouraged. CWA is prayerfully seeking enough faithful volunteers so that each of the 236 legislators will be individually prayed for during the 2016 legislative session (January 11 – end of March). CWA will provide the postcard; all you have to do is provide the stamp(s) and a commitment to pray and encourage. We are looking for your commitment today. Your packet will be mailed to you mid-January, 2016. We cannot think of anything more powerful than to pray for those in authority; those who make public policy decisions that impact our daily lives. I hope you will be a part!